Ahh, I really wanted to have my blog post for today written yesterday. I wanted to “take the day off” today. Well, I taught a Nia Class this morning. And I have a Gentle Yoga Class to teach tonight, so I am not really taking the day off. I just didn’t want to have to think about a blog post or clean any part of the house today. I was going to take the day off from cleaning and doing chores. Ha. Well, it didn’t work out that way. But it is still a good day. We had a bit of rain. But that just made the traffic this morning very bad. My hubby was very thoughtful and called me to alert me to the chaos on the freeways this morning. So I left early than I normally do to get to class. I started to get on the freeway and got right back off. Since the traffic was not normal Thursday morning traffic I didn’t know if there were accidents that were blocking the roads so I decided to chance it and take the inner city streets. I actually made it to class RIGHT ON TIME! Which to me is not “on time” because I need to do a little set up before we start. But we still started only about five minutes late. Most of the Nia students didn’t even know we started late. So it worked out. The rain was only a very small amount, but it was moisture. That is a good thing. So there are a lot of things that can go into my Goodie Jar just today. So I am making this a check in day. I haven’t checked in on you and your Goodie Jar for four months. I am still putting things in mine. I ALWAYS have something to put in mine. Regardless of what is going on I consider myself blessed. I hope you have at least one thing you can put into your jar. I am doing a check in as a sort of “day off” from writing a blog post. Since I didn’t get the day off from chores and cleaning. I really don’t need a day off from teaching. Teaching is fun and I get so much good energy from my Nia and yoga students it doesn’t count as work. I can do without the extra travel time and traffic, but . . . we need the rain. Don’t know why it practically shuts our freeways down . . . but whatever. Rain. To class on time. Birthday love. Hubby cooking dinner. These are the things that make me smile that I put in my Good Things Jar. I have seen some people post on Facebook and others on their blog that some of you have gotten new family members . . . whether human or animal, that is a thing for the Goodie Jar. I always put notes about my family in my Goodie Jar. So . . . what about you? 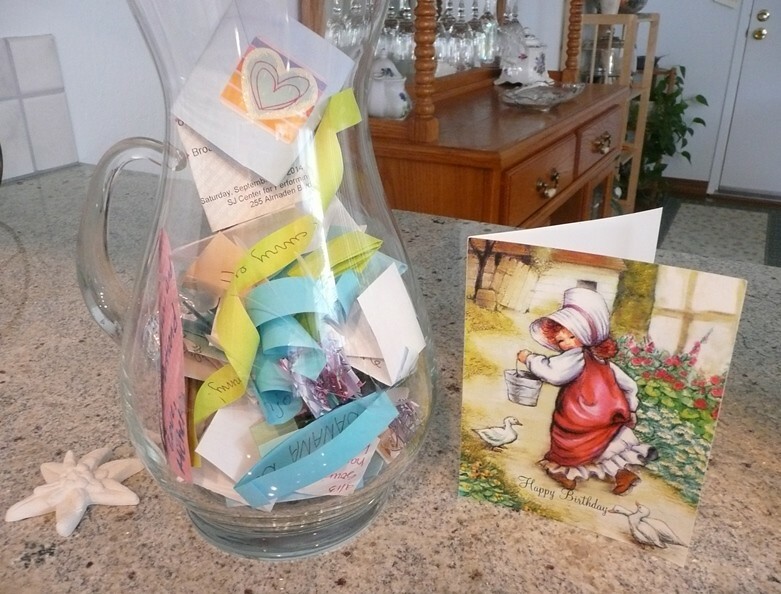 Are you still putting things in your Good Things Jar? What have you added recently?